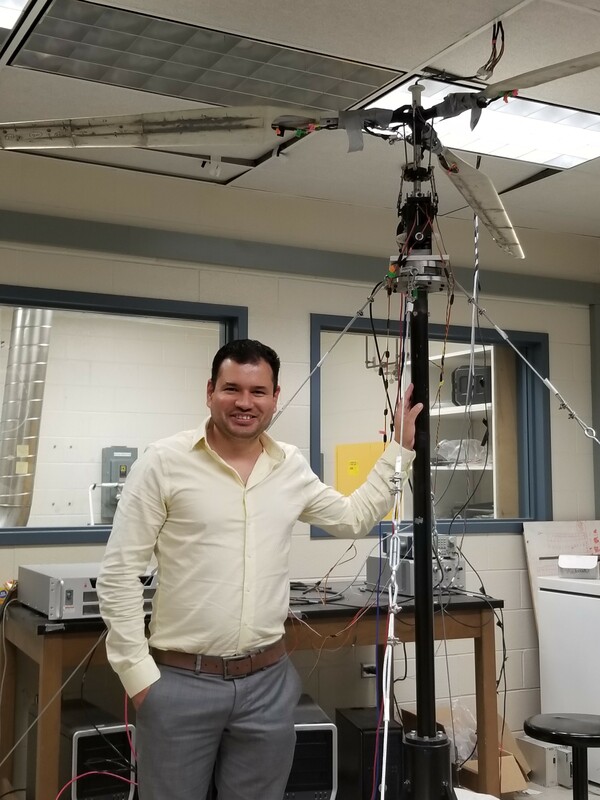 An NSF CAREER Award was recently granted to study fundamental fluid vortex breakdown at high Reynolds numbers in wind turbines and vertical takeoff and landing (VTOL) aircraft and drones. This project, awarded in the amount of $500,000 on January, 2018 is entitled “Control of Vortex Breakdown in High-Reynolds Number Rotor Flows with Secondary Vortex Structures” (NSF award # 1751918). The project is led by Dr. Victor Maldonado, assistant professor in the Department of Mechanical Engineering at the University of Texas at San Antonio. New technique at the WoW. The experiments will be conducted at the NSF NHERI Wall of Wind Experimental Facility at Florida International University. This will mark the first time the WOW facility uses particle image velocimetry (PIV), a laser-based flow diagnostics technique that will be used to track and quantify the motion of smoke particles surrounding a rotating large-scale rotor blade. This project demonstrates how the WOW EF enables fundamental high-Reynolds (Re) number experiments to improve the flow-energy performance of full-scale rotating energy systems. Controlling blade-tip vortex breakdown. The proposed research and large-scale high-Re experiments in the WOW EF will test new theories and create new knowledge on the characteristics of secondary vortices (including length and time scales, vorticity) that can be used for vortex breakdown. It is hypothesized that producing secondary vortices via piezoelectric wall-oscillations at the correct length and time scales leads to breakdown or diffusion of the blade-tip vortex structure. The project seeks to control blade-tip vortex breakdown, and consequently turbulent kinetic energy of the flow in the blade tip region, which is believed to be responsible for blade structural vibration and contribute to rotor wake turbulence. The flow will be measured using stereoscopic particle image velocimetry (SPIV) techniques, and analyzed using proper orthogonal decomposition (POD) and three-dimensional flow reconstruction from an array of two-dimensional measurement planes. These methods are uniquely suited for large-domain high-Re vortex flows and will shed light on tip vortex energy content/ POD modes responsible for inducing blade structural vibration. Developing future engineers. A framework for integrated research-education training based on proven NSF models will provide students exposure to broad opportunities to deepen their understanding of scholarship, entrepreneurship, and social impact – thereby making a legacy to transform society. Experiments in the WOW EF will address the crucial need to increase the pool of thermal-fluids engineers trained in high-Reynolds number flow experimentation aimed to develop more efficient rotor blades and flow-power systems. A new stereo particle image velocimetry (SPIV) open-source database will be made available via DesignSafe-CI.org (the NHERI Cyberinfrastructure with Data Depot) to encourage further collaboration and understanding of the fluid dynamics and control of high Reynolds number vortex flows.